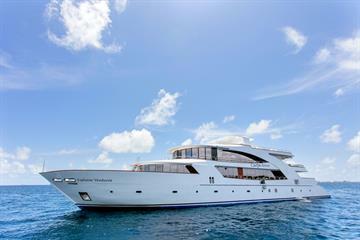 Liveaboards in Meemu Atoll find themselves amongst some of the best-loved Maldives dive sites, but still enjoy a delectable measure of the seclusion that typifies the Southern Atolls area. While whale sharks may appear every once in a while (as in Thaa Atoll), manta rays can be seen on almost every dive, along with a rich array of sea life and underwater landscapes. Fast-moving currents full of plankton enter the atollís deep channels from the eastern and western rims; this influx of life-nourishing plant and animal matter is what attracts schools of fish, and large pelagics, to Meemu. 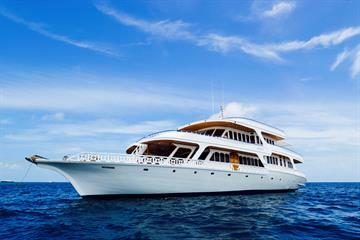 A variety of Maldives liveaboards conduct cruises that visit Laamu Atoll as part of their trips. 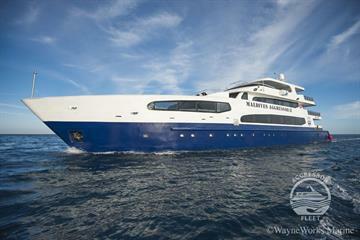 Liveaboard diving in Meemu is a great way to see manta rays, especially during the wet season from May through November. At any time of year, however, grey reef sharks and eagle rays are abundant. Schools of tuna and jacks are also common sights, preying on fish from reefs which are stocked with colorful inhabitants, including some large ones like Napoleon wrasse. Scuba diving in Meemu often enjoys a backdrop of vibrantly colored soft corals, which decorate a variety of topographic features, from thilas, to caverns, to walls. Diving in Meemu Atoll on a liveaboard almost always means visiting Medhufushi Thila, a dive site famous for its high density of reef fish, such as groupers, snappers, and sweetlips. The overhangs of the site are festooned with swaying soft corals. Like any thila, Medhufushi attracts pelagic hunters such as tuna and jacks. What makes this thila different is that the current sometimes abates to the point that even less experienced divers can sometimes descend to enjoy the scene. 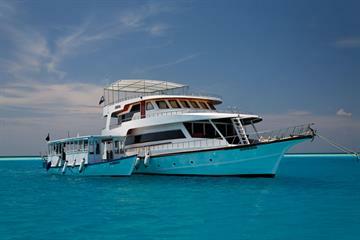 Mulaku Kandu is a great channel to sight sharks, eagle rays, and Napoleon wrasse if youíre liveaboard diving in Meemu. The incoming current is strong, however, so dive cruises will probably restrict this site to experienced divers who can safely manage a negatively buoyant descent. Muli Cornerís protected area is full of wildlife, though the kinds of creatures may change with the monsoon seasons. During the dry northeast monsoon, sharks are abundant, while the rainier southwest monsoon turns the site into a manta cleaning station. A liveaboard diving trip in Meemu is not complete without a visit to Mantas and More, a famous, shallow cleaning station that offers beautiful coral, tuna, barracuda, sharks, and Napoleon wrasse, in addition to its winged giants. Like anywhere in the Maldives, Meemu Atoll is best dived by liveaboard; in no other way can you access so many dive sites, often near uninhabited islands or far from land. 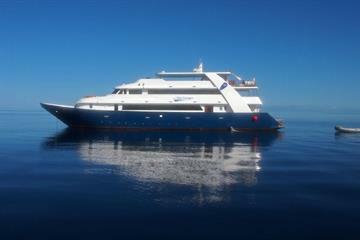 The length of liveaboard itineraries which visit Meemu Atoll usually ranges from 7 to 10 nights, with a budget from 200 to a bit over 300 euros per night. Liveaboard boats in Meemu Atoll almost always include other Southern Atolls destinations, and sometimes include the Central Atolls. A few even add the Deep South Atolls in a north-south traverse that crosses a whole half of the archipelago. 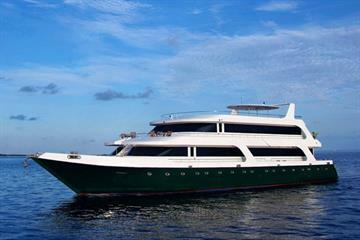 The Maldives capital Male is one liveaboard departure location for Meemu Atoll liveaboards, accessible by direct flights from Dubai, Singapore, and Colombo. However, there are many other Southern Atolls departure ports, including Kadhoo, Koodoo, Laamu, Medhufushi, and Gan. To get to these locations from Male, visitors should take a domestic seaplane; trips are usually around an hour. Maldives liveaboard diving in Meemu Atoll is possible all year round, though the presence of certain wildlife can change with the season. During the rainier southwest monsoon from May through December, mantas are at their most abundant. The water temperature usually stays between 27 and 30 C, and visibility tends to be excellent, between 20 and 30 meters.